The Associated Musicians of Greater New York, the largest union of professional musicians in the world | The world's largest local union of professional musicians. 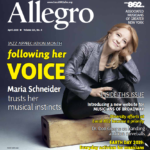 In case you missed it, the latest issue of Allegro, our award-winning magazine, is online! Stay up to date on union business, discussions about the music industry, legislation, and the music community. Read the April 2019 issue here. #MusiciansofNY tells the stories of the working union musicians of New York, with posts about a new musician every week on Local 802’s Facebook, Twitter, and Instagram. Longer versions of these features are archived on the website. From monthly updates on collective bargaining agreements to discussions about copyright protection, common challenges facing musicians and the joy of making music in the cultural capital of the world, Allegro keeps musicians up to date about issues and ideas at the forefront of New York City’s music scene. Local 802 supports the important work of the Broadway Green Alliance, on Broadway and through its Off-Broadway chapter, and recommends that Local 802 administration, staff, and musicians throughout the music industry foster an environment that welcomes and encourages the use of sustainable practices in their workplaces. Jazz in the Afternoon presents Ross Kratter Jazz Orchestra on Thursday, April 25 from 5:00pm – 6:30pm in the Local 802 Clubroom. Proceeds to benefit the Musicians’ Emergency Relief Fund. Donations can be made by cash, check or credit card.